Walls provide basic damage protection against enemies. They are used to protect fragile targets from advancing enemy forces, and extend the amount of time defensive structures like turrets have to kill the enemy. While walls block movement for both the player and enemies, gates can be constructed to allow easy automatic passage for the player. Gates share the same health and resistances to walls, so no defensive power is lost. Walls do not block projectiles, however, allowing both the player and enemies to shoot over the walls at nearby targets. Ensure that all walls built are far enough away from precious machines so they cannot be damaged over the walls. Due to projectiles' ability to fly over walls, turrets built behind walls will be able to shoot at enemies. This is optimal, as it allows turrets to avoid damage from melee fighters, which must break through the wall to attack targets behind it. Although, care should be taken as the game progresses and enemies evolve because big and behemoth biters can attack 2 tiles away, meaning they can hit structures directly behind a single layer of walls. To prevent this, structures can be moved further back from the walls or a second layer of walls can be added. Due to the resistance of stone walls, they can take a long amount of time to destroy, despite having less health than most defensive structures. However, it may be necessary in some cases to double-layer walls or even place them in maze-like formations, to slow down enemies even more. Doubled stack size of walls, to 100. Walls with gates now can accept any signal type. Increased the collision box of walls slightly. Walls and gates are now fast replaceable. Stone walls now need Research to unlock. Repair speed is twice as fast. Changed collision box logic. 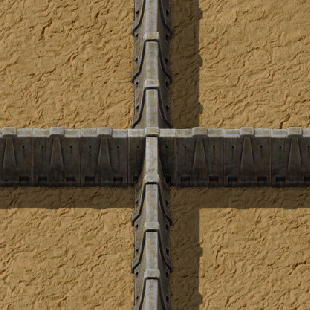 It is possible to walk between diagonal walls now, but not when connected. Doubled the stack size of walls. Walls now leave remnants when destroyed. Increased wall health from 200 to 350. Added textures for a single piece of wall.